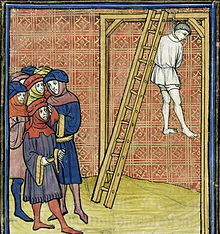 On this date in 1278, humiliatingly dressed like a buffoon, Pierre de La Brosse was strung up at Montfaucon without benefit of trial. De La Brosse (English Wikipedia entry | French) was a court figure of the petty nobility. He cut his teeth — and a holy beard — as a surgeon and barber in the court of Saint Louis. When Louis died on crusade in 1270, Philip the Bold succeeded to the throne. Philip was tight with Pierre, so this seemed like great news for the chamberlain — and indeed, de La Brosse advanced rapidly with the new king’s patronage in wealth and influence. The power of this Touraine arriviste did not fail to attract the enmity of the realm’s hereditary lords. As their grandchildren would do in Enguerrand de Marigny‘s time, they nursed their resentments and awaited only their chance. King Philip’s marriage in 1274 to Marie of Brabant* gave them that chance. Philip “investigated” this by sending emissaries to consult a clairvoyant who, knowing she was speaking to representatives of the royal family, gave a judiciously positive appraisal of the queen, leaving de La Brosse on very tenuous footing indeed. The barons cut that footing out from under their foe a few months later when they produced documents, likely forged, implicating de La Brosse in a treasonable arrangement with the Spanish crown. De La Brosse was imprisoned for six months and condemned without a regular judicial proceeding: he has the unenviable distinction of being the first victim of an extraordinary royal commission in France. That commission destroyed the evidence (or “evidence”) in the case, but to judge from the positive appraisal de La Brosse enjoyed from chroniclers the popular sentiment for his innocence was widespread. Pierre de La Brosse is among the several French royal counselors who are sometimes apocryphally said to have built the Montfaucon gallows only to hang upon them. The last word on him (and the more interesting trivia) belongs to Dante, who stationed the man in Purgatory as one who was unjustly slain but without opportunity to cleanse his soul with a last repentance. * Not to be confused with the Bavarian princess of that name who was put to death for adultery. ** Another way to interpret this: poisoning suspicions that were afoot generally came to be ascribed specifically to de La Brosse.